Make your own eye-catching signs with these high-quality stencils with BetterLetter. They are crafted of sturdy oil board — a long-lasting material fused with drying oils to resist bleed-through. This results in edges that stay crisp and resist fuzzing, even with repeated use. ® Westcott is a registered trademark. ® C-Thru is a registered trademark. 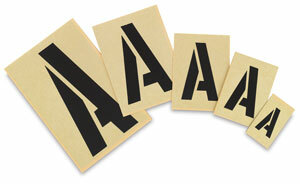 ® BetterLetter is a registered trademark.